Matt likes to tell you how good he is at making pizza. He did work at Gem City for years, so he has made a lot of them. After hearing how wonderful his pizzas are time after time, I had never seen him actually make a pizza (other than the frozen variety... he is pretty good at that!) Then finally, one Friday in November in 2009 he finally made me a pizza and asked me to marry him. I don't remember much about how the pizza tasted because I was more worried about the diamond! So, I will tell you how the subsequent pizzas were... but there haven't been any. It turns out that Matt only knows how to make pizza dough 50 pounds at a time. He makes homemade sauce too, but in five gallon buckets. He made some practice run pizzas before the big engagement pizzas. He tried the mixes in the store, but they weren't good enough. So, he went to Gem City and got some dough! All of that to say, I spent the first few years of our relationship not making pizza because I was with this world famous pizza maker. Then I realized that if I wanted pizza, I was going to have to make it myself. Due to my aforementioned hesitation to use yeast, I tried a baking soda recipe that was decent. It was fast and easy because there was no need to knead and no rising and resting. It was better than nothing! A few months ago I decided yeast wasn't so scary. 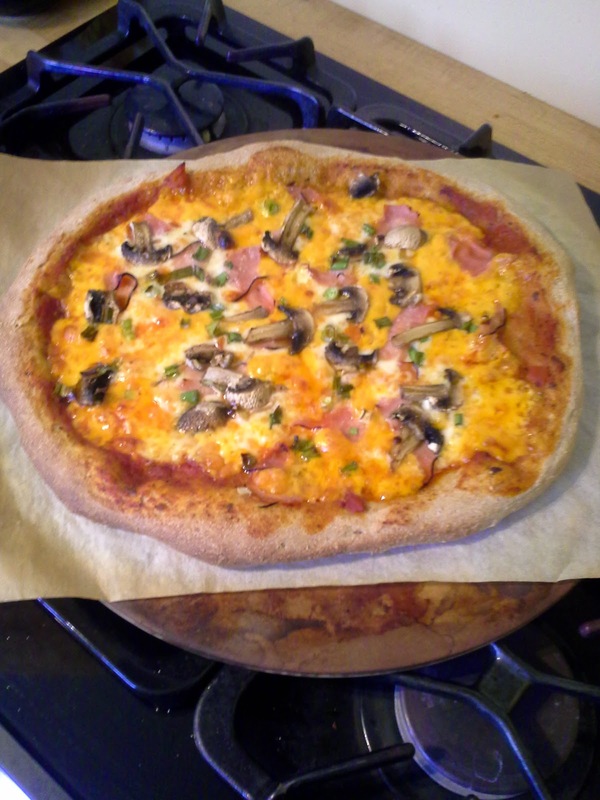 So, I made real pizza dough and our lives have changed forever! I started with a recipe that was on the bag of flour and made a few small tweaks and this is what I have come up with. 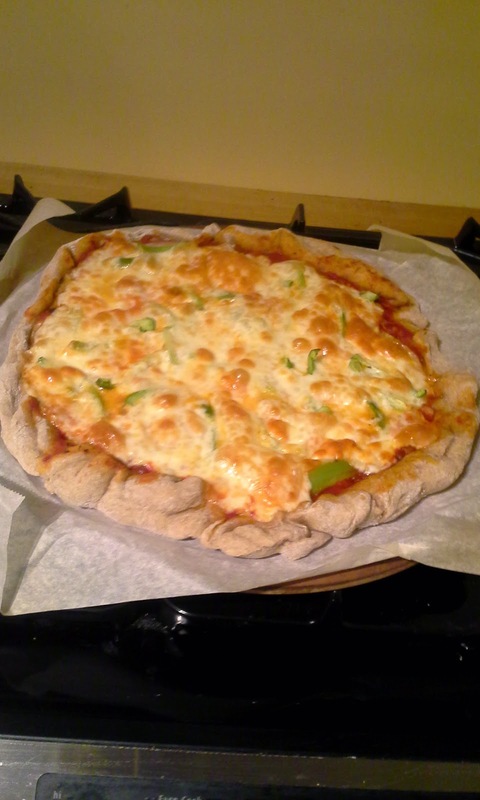 We went from only eating pizza of the frozen or ordered variety to eating yummy homemade pizza at least a couple of times a month. I have used this crust for breakfast pizza, sloppy joe pizza, plenty of ham pizzas, a few calzones and even stuffed it with cream cheese, peppers and Italian sausage for New Year's Eve. What I did today was make the dough first thing this morning. I let it rise the first time and then put it in the fridge while I worked. I split it and set the part I was going to use on the counter until I got home from picking Jax up. Then it was ready to become a tasty pizza! Luckily I had a bit of Sunday Gravy left from the other day, so that made an excellent sauce. Yum!!! I usually put the water in the microwave for about a minute to warm it up. You don't want it too hot, just enough to warm up the bowl and the rest of the ingredients so the yeast will be nice and happy. Mix it all together! You may have to adjust the amount of flour and water depending on how it feels. You want it to be a little bit sticky still, but not wet. Turn the dough onto a floured surface and kneed your little heart out. Due to the grain in the whole wheat, it won't be a smooth dough but you should feel the gluten start to do it's thing. Put dough into an oiled bowl and let rise for an hour or until doubled in size. For a thin crust, split the dough in two. I usually freeze half at this stage and use the other half. Preheat oven (and pizza stone if you are using one) to 425 F.
At this stage I do a few different things. 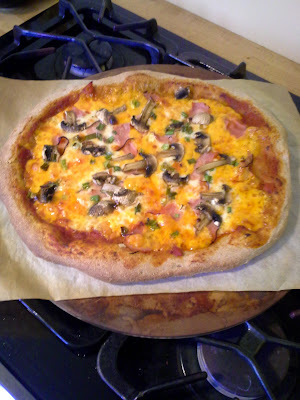 If I am using a pizza stone, I roll the dough to the right size and top with yummieness. I usually put the pizza on parchment paper to make it easier to transfer to the hot stone. If I am using a pizza pan, I spray it lightly and just push the dough around with my fingers. I have good results both ways. Using the pan is a bit easier, but the stone gives a guaranteed crunch on the bottom of the crust. Bake for 15-20 minutes and enjoy!